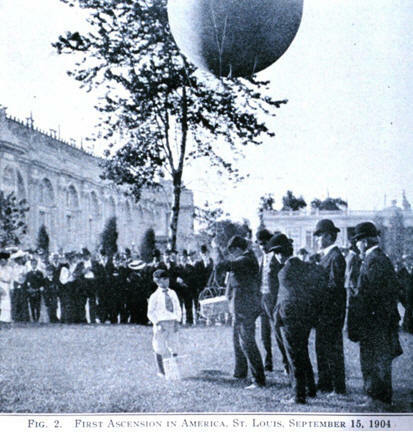 The earliest balloon flights could be said to be scientific in nature because no one knew what the effects would be. Montgolfier's passengers—animal and human—experienced no ill effects from their flights. Jacques Charles, who climbed in 1783, to almost 9,000 feet (2,743 meters) in a hydrogen-filled balloon, suffered severe pain in his ear from gas trapped in the middle ear. John Jeffries, an American physician, performed barometric, thermometric, and hygrometric observations in flights over London during 1784, and sampled air at different altitudes. He had planned to make additional atmospheric observations when he and the French aeronaut Jean-Pierre Blanchard crossed the English Channel in a hydrogen-filled balloon in 1785. Unfortunately, they had to throw their scientific instruments overboard to keep the balloon aloft and did not make any scientific observations. When Jeffries returned to the United States, he wrote of his experiences. His legacy survives in the John Jeffries Award, which is presented annually to the physician who makes the greatest contribution to aerospace medicine. A July 1803 flight in Hamburg, Germany, was the first made expressly for scientific purposes. Etienne Robertson and a music teacher named Lloest ascended in L'Entrepremant, the balloon that had served Napoleon at the Battle of Fleurus in 1794. After the flight, Robertson claimed to have climbed to a record 23,526 feet (7,171 meters). But others were skeptical because of Robertson's outlandish description of the effects of the high altitude and also because it was doubtful that two people could have ascended to such an altitude with a balloon as small as L'Entrepremant. The scientists J.B. Biot and Joseph Louis Gay-Lussac made electromagnetic observations in their flight from the Conservatoire des Arts et Métiers in Paris on August 24, 1804. According to their barometer, they rose to 13,000 feet (3,962 meters). Later, Gay-Lussac made another flight by himself and ascended to 23,000 feet (7,010 meters)—a record that was held for 50 years. At that height, he experienced quickened pulse, shortness of breath, and finally unconsciousness—symptoms of oxygen deprivation—until the balloon began to descend. He still managed, however, to collect air samples at over 20,000 feet (6,000 meters), study the variation of pressure and temperature, and repeat his earlier electromagnetic observations. Gay-Lussac's was the last important high-altitude flight until 1862, when two Englishmen, Henry Coxwell and James Glaisher, made several fairly uneventful high-altitude flights. They rose to a height of 24,000 feet (7,315 meters) from Wolveringhampton, England, using a new balloon with a capacity of 90,000 cubic feet (2,548.5 cubic meters) that they later named the Mammoth. On September 5, 1862, however, their flight was anything but routine. It began much like any other. The weather was overcast and chilly, and at 11,000 feet (3,353 meters), they rose through the clouds into bright sunshine. They reached the height of 5 miles (8 kilometers), which was higher than a manned balloon had ever risen. At this point, problems began. Glaisher began to have trouble seeing and could not read his instruments. Coxwell, having exerted himself more, had difficulty breathing. In addition, the balloon cord had become tangled, and they could not release gas to allow the balloon to descend. They continued to rise, reaching 29,000 feet (8,839 meters). Glaisher first became unable to move his limbs, then could not speak, and finally lost consciousness. Eventually, he regained consciousness and continued to observe his symptoms. Coxwell's hand had become numb from the cold, but he finally was able to grasp the balloon cord with his teeth and release hydrogen so that the balloon descended and landed safely. Both passengers survived extreme oxygen deprivation. Glaisher estimated that they had reached 37,000 feet (11,278 meters) or 7 miles (11.3 kilometers). Others thought it was more in the range of 30,000 feet (9,144 meters), which was still higher than anyone had flown before without breathing apparatus. Both men made several more flights, but neither ever flew quite so high again. Over the course of their 27 flights, they systematically tested the scientific potential of the balloon and made many important scientific observations. They measured air temperature and the atmospheric moisture at different elevations. They used different types of thermometers and barometers for comparative temperature and pressure measurements. They investigated the electricity and the oxygen levels in the atmosphere and determined the direction and electricity of the atmospheric currents at different altitudes. They determined the types and heights of clouds and their density and thickness. Their last flight was on May 26, 1866. In Paris in the early 1870s, the French physiologist, Paul Bert, conducted some 700 experiments with barometric pressure and became known as the "Father of Aviation Medicine." He used sparrows to study the effects of different atmospheres on survival. Bert proved that the reduced air pressure at high altitudes had a major impact on the body. He built the first low-pressure, or decompression, chamber—an airtight tank in which the atmospheric pressure could be varied to simulate any altitude. The scientists Sivel and Croce-Spinelli subjected themselves to low pressures in Bert's chamber to learn how to use oxygen to protect themselves at high altitudes. After one successful high-altitude flight, they tried another in April 1875. Joined by the balloonist Gaston Tissandier, they ascended in the Zénith from a site near Paris in order to test an oxygen breathing apparatus that had been tested successfully in a decompression chamber. But they took too little oxygen with them and decided to hold off from using their supply as long as they could. They climbed to 28,820 feet (8,784 meters). At that height, they lost the use of their limbs so they could not use their meager oxygen supply. They became unconscious. While unconscious, they began an uncontrolled climb because they had thrown out too much ballast. Tissandier somehow regained consciousness and found that the balloon had started descending on its own, carrying two unconscious, and very likely dead, aeronauts. He managed to bring the balloon down safely and survived, but Sivel and Croce-Spinelli were dead. This tragedy demonstrated the importance of using oxygen masks rather than depending on self-administration of oxygen when the balloonist felt he needed it. It also showed the importance of acclimating oneself to high-altitude conditions. Tissandier, and Coxwell and Glaisher before him, had made several high-altitude flights and had built up some tolerance to reduced oxygen levels. Sivel and Croce-Spinelli had never made high-altitude flights before but had relied only on their experiences in the decompression chamber—with fatal results. During this period, the use of unmanned meteorological research balloons to probe the upper atmosphere began. In 1892, the French scientist Gustave Hermite and the aeronaut Georges Besancon used unmanned fabric or paper balloons that carried instruments. In 1901, they constructed small rubber balloons that were designed to expand until reaching a particular altitude where they would burst. Then their instruments would descend by parachute. The last of the manned high-altitude balloon flights occurred at the end of the nineteenth century. On December 4, 1894, Herr Berson rose to 30,000 feet (9,144 meters) in his 92,000-cubic-foot (2,605-cubic-meter) Phoenix from a site in Strasburg, Austria. His improved instruments accurately recorded temperatures that were unaffected by solar radiation. In 1901, Berson and Professor Süring, both of the Prussian Meteorological Institute, ascended in the Preussen (Prussia) to a record height of 35,500 feet (10,820 meters). This record stood until 1931 when Auguste Piccard of Switzerland set a new record. French sounding balloons constructed by Jules Richard began to be used in 1893. These unmanned balloons, carrying light, but very precise instruments, approached an altitude of 50,000 feet (15,240 meters). In 1899, the meteorologist Léon Teisserenc de Bort discovered the stratosphere, the zone between 33,000 and 66,000 feet (10,058 and 20,117 meters) above the Earth's surface where temperatures remain the same or even increase with increasing height. In 1897, the Swedish engineer Salomon Andrze tried to fly across the North Pole in a balloon. His balloon went down, though, three days after its ascent from the island of Spitsbergen in Norway. His remains were not found until the 1930s.